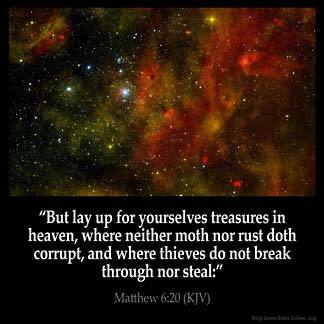 MATTHEW 6:20 KJV "But lay up for yourselves treasures in heaven, where neither moth nor rust doth corrupt, and where thieves..."
17But thou, when thou fastest, anoint thine head, and wash thy face; 18That thou appear not unto men to fast, but unto thy Father which is in secret: and thy Father, which seeth in secret, shall reward thee openly. 19Lay not up for yourselves treasures upon earth, where moth and rust doth corrupt, and where thieves break through and steal: 20But lay up for yourselves treasures in heaven, where neither moth nor rust doth corrupt, and where thieves do not break through nor steal: 21For where your treasure is, there will your heart be also. 22The light of the body is the eye: if therefore thine eye be single, thy whole body shall be full of light. 23But if thine eye be evil, thy whole body shall be full of darkness. If therefore the light that is in thee be darkness, how great is that darkness! But lay vp for your selues treasures in heauen, where neither moth nor rust doth corrupt, & where theeues doe not breake thorow, nor steale. But amass wealth for yourselves in Heaven, where neither the moth nor wear-and-tear destroys, and where thieves do not break in and steal. but gadere to you tresouris in heuene, where nether ruste ne mouyte distrieth, and where theues deluen not out, ne stelen. Mt 6:20 Lay up for yourselves treasures in heaven. This is the only way to save our wealth. It is a positive precept. Our wealth must be consecrated to God and used as his work demands. Wealth used for doing good is treasure laid up in heaven. I am to lay up treasures in heaven. What is going to be in heaven ? Jesus : God : Holy Spirit : God 's word : Angels : Beautiful surroundings : Love : Joy : Peace : Etc : What I receive from my Lord God in this life and what I do for Him in this life and how I conduct my manner of life in this life is what I will receive in heaven : if I do that which us evil in God 's sight here I lose reward in heaven : So I must endeavor to do that which is right !!!! Laying up treasures in heaven is not synonymous with staying away and losing interest in life endeavors,. While the word of GOD condemns slothfulness, laziness, it urges us to do things heartily as to the lord and not men (Colossians 3:23,24), which means we are called to excel (give the best we can) in all we do; including business and profession� However, we are warned against dishonesty, greed, love of money, selfishness and all excess that life tends to drive us in. In doing things heartily, obeying the lord, we are laying up treasures for ourselves in heaven�.